Here comes to second part, what have the students said about their peers and feeling upon graduation? Say something about your classmates? Celestine: I love how close-knitted we are; only having 23 students in Nutrition. I love how I know every single one of my classmates by name, if not by the outfit they wear. Nhien Hao: I met extraordinary friendly and thoughtful classmates in Bioscience. Friendship, it is the most precious treasure I have ever had in Malaysia. They were always there, caring and supporting me through all of the ups and downs and always patiently listening to my ‘relatively poor’ English. I feel so thankful. Stephane: I met some of the nicest, funniest and craziest people that I am proud to know and call my friends. We had first real biotech lab experiences together (yet sadly didn’t get to clone anything) and had loads of fun coursework. 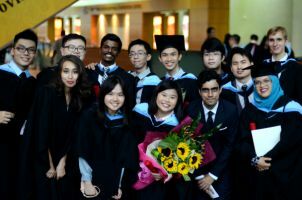 Wei Harn: A shout out to my friends for making my journey through university a memorable one. Kartik: In these 3 years I have met the nicest, funniest, interesting and wonderful people who I can call them my good and best friends. I am going to miss them so dearly. How do you feel upon graduation? Stephane: It’s weird, I feel like these were the fastest 3 years of my life and I really regret as they were also some of the best! Xin Yi: Time flies and a million memories flashed through my mind. First arrived knowing no one and in the blink of an eye the time has come to bid farewell to everyone. Kartik: Wow! That is how I felt for 3 years of my university life. Full of fun, enjoyment, wonderful experiences, friends and lectures made these 3 years an unforgettable moment of my life.